Prophetstown farmer invited to share his regulatory concerns with Speaker of the House during Thursday evening's Presidential address to Congress. Rock Katschnig, the Illinois farmer who asked President Barack Obama not to "challenge us with more rules and regulations from Washington, D.C." during the president's Midwest bus tour stop at Wyffels Hybrids, Atkinson, Ill., will attend the president's speech to a joint session of Congress tonight (Thursday, Sept. 8). As one of a dozen "job creators" invited by Chief Deputy Whip and Congressman Peter Roskam, R-Ill., Katschnig will sit in the speaker's box for the president's speech, which will address the need to create jobs and grow the nation's economy. 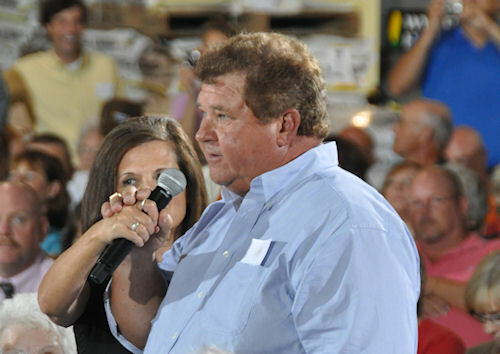 Rock Katschnig, a farmer from Illinois, asks President Obama a question during last month's rural tour. During his time in Washington, D.C., Katschnig and other job creators are scheduled to meet with House Speaker John Boehner, R-Ohio, and Majority Leader Eric Cantor, R-Va., as well as several other Congressmen from Illinois. Each of the 12 job creators also will make videos which will be posted to www.GOP.gov and www.americanjobcreators.com. Katschnig had plans to pick corn on his 3,500-acre farm in Henry County, before he was invited to Washington. During the president's August town hall meeting in Atkinson, Ill., Katschnig gained notoriety for asking the president about the possibility of new regulations on noise, water runoff and dust, which could hurt Illinois farmers. During his trip to Washington, D.C., Katschnig will have opportunities to share his concerns about EPA regulations that would overlap those areas already covered by the Illinois Department of Agriculture.